On Sunday, May 1, the Aguirre-Oestmann family commemorated the first anniversary of the death of Doña Anna, our bishop’s mother. To commemorate the end of the first year, a Eucharist was celebrated in which the family and those close to the family participated. It took place in Doña Anna’s home. On Monday, May 2, the seminarians returned to the seminary to continue their education, having spent several days in various communities doing pastoral work and then a week of vacation. During the next five weeks, the seminarians will continue wrapping up the first semester. The second semester will begin after a week of examinations and integrative exercises and activities. Spring is an especially beautiful time at the seminary. The hillsides turn green again, and an atmosphere of peace and spirituality can be breathed everywhere. 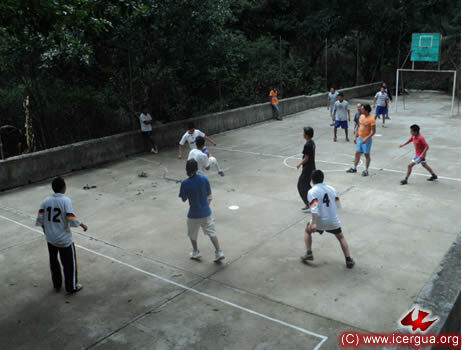 The educational program tries to integrate all aspects of the person—spiritual formation, academic instruction, pastoral education, development of personal skills, and also, as time permits, physical exercise, as in the photograph at left, taken while the seminarians were playing soccer. 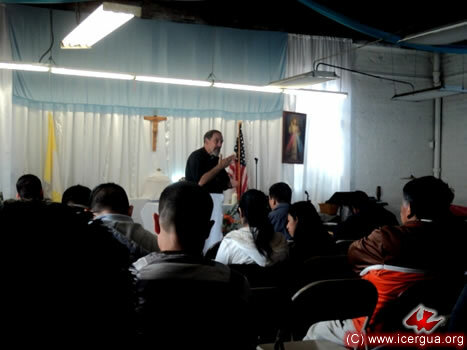 On Saturday, May 7, our bishop visited the communities that comprise the San Miguel Arcángel Parish in Los Angeles, California. With perseverance and patience the communities are becoming more and more organized to live the liturgy with greater intensity. 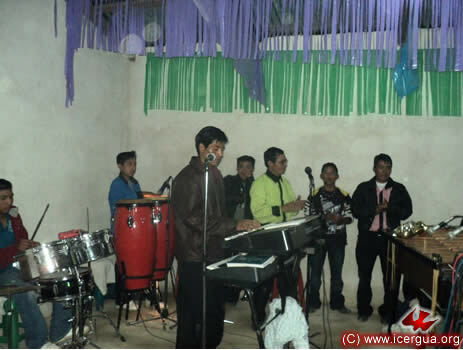 Especially noteworthy is the growth of the musical ministries that have been organized in the communities. Right: The faithful who are about to receive the sacrament of Reconciliation after confessing their sins are coming forward to receive Absolution. 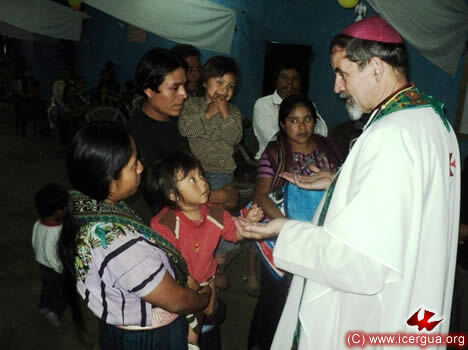 In the evening, the bishop celebrated Eucharist with the “Pacto Divino” Community. In the photograph, with the bishop are brothers Danilo and Nicolás, both members of the Council of the Community and Communion Ministers. 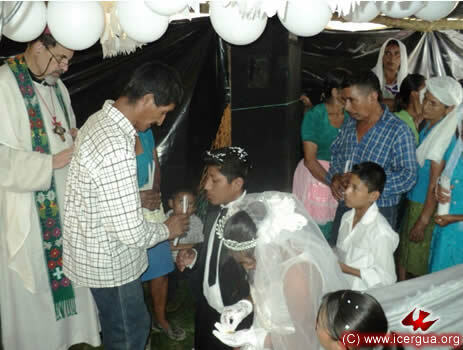 Right: The faithful come forward devoutly to receive the Holy Communion. 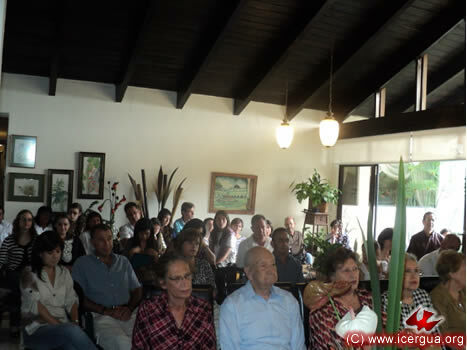 The “Restauración” Community celebrated a vigil on May 7. The bishop was invited to participate and give a catechetical lesson on the meaning of the Eucharist. The community is taking the steps necessary to maintain the Reserve of the Most Holy Sacrament. The bishop emphasized the importance of the fact that all authentically Christian life in the Spirit has its foundation in the sacraments and, in particular, its center and source of growth is in the Eucharist. Recently the DETYM in Los Angeles has been growing. The number of faithful who are receiving education in the Department of Theology and Ministries (DETYM) for the People of God has almost doubled. We hope that the Lord will give them perseverance to stay with the course to the end. 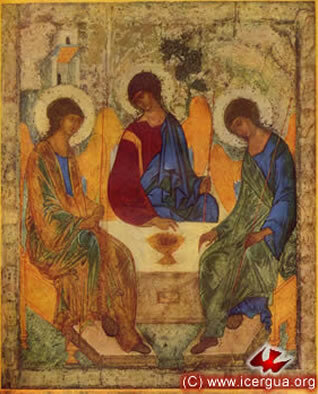 The two courses being offered at present are: “The Synoptic Gospels” and “Christology.” Although the shortage of time does not allow a deep treatment of these themes, it is hoped that the foundation for the faith that the believers celebrate will with each session become stronger and firmer. 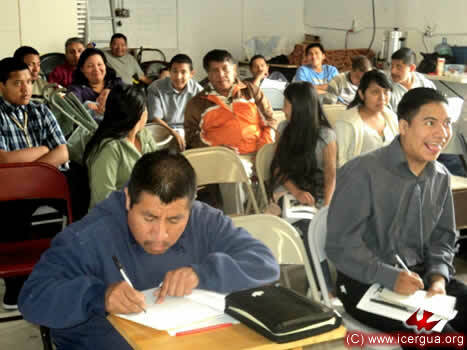 In the photograph at left, one can see how dedicated the faithful are in continuing their education. On May 8, at the close of the DETYM sessions, the bishop celebrated Eucharist with the faithful who could attend. 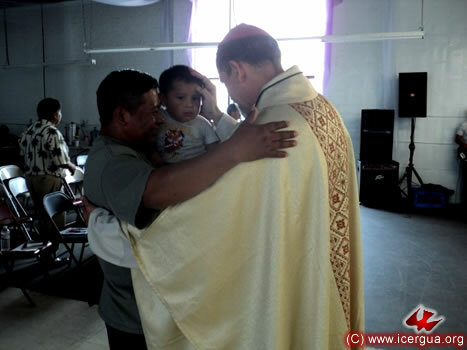 Left: The exchange of Peace, during which the faithful are blessing one of the children who were participating. 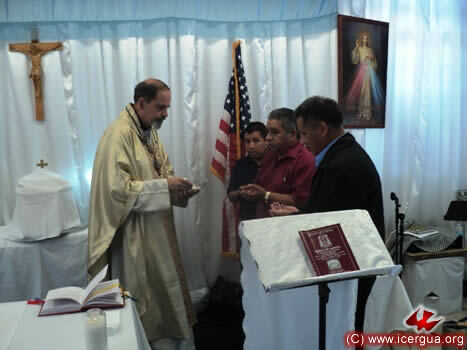 Right: Brothers Ramón (the Community Coordinator), León and Matías (Communion Ministers) are preparing to receive Holy Communion. 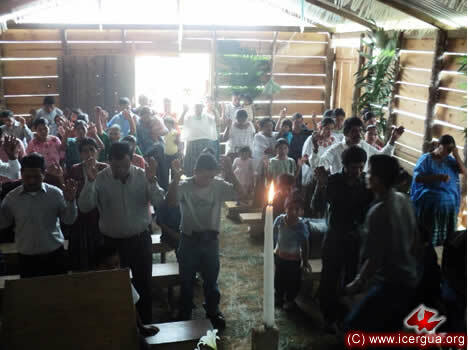 On May 13, the Pajomel Community began to celebrate the twenty-seventh anniversary of its birth. It did so with a Eucharist for the leaders of the community. On the next day events for all members and their guests began. During the homily the bishop emphasized that the celebration of an anniversary implies not only thanksgiving for achievements but also some soul-searching to discern shortcomings. Above all it involves a renewed commitment to carry out fully the mission that has been entrusted to us. 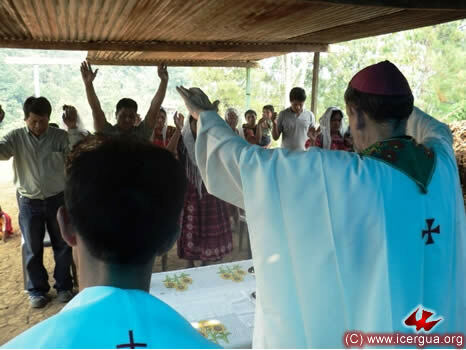 At dusk on May 13, the bishop presided at the Eucharistic celebration with the Chuitzanchaj Community, Santa Cruz La Laguna, Sololá. The faithful have been particularly concerned about improving the quality of the Music Ministry. 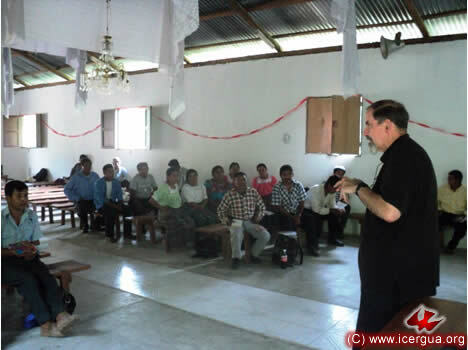 With the enthusiastic leadership of brother Lucas, in the center in the photograph at left, the brothers in this ministry have progressed remarkably. 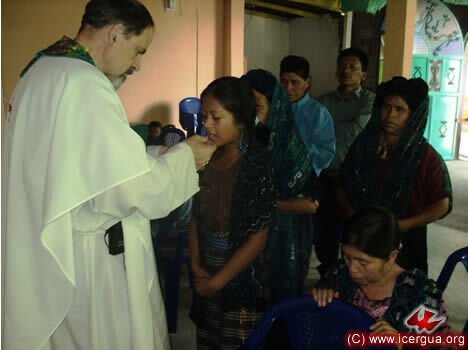 The bishop’s visit provided the opportunity for a little girl to be initiated into Christian Life. The child is the daughter of brother Trinidad, one of the leaders of the community and a communion minister. 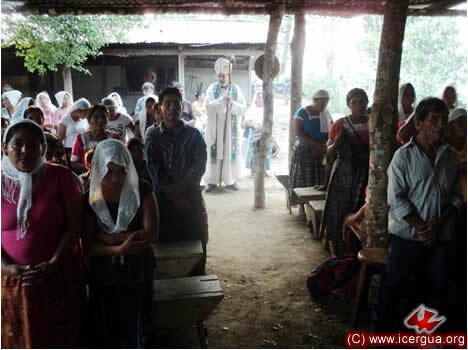 On Saturday morning, May 14, about 140 faithful participated in the Assembly of the Deanery of South Huehuetenango, which basically is the Mam ethnic-linguistic area and some communities of Santa María Chiquimula, Totonicapán, and of Aguacatán, Huehuetenango. The representatives from the various centers and parishes described the situations in their communities, emphasizing the growth that is taking place. During the instruction period the bishop addressed the theme that will be developed in the Pastoral Letter concerning guidelines for the social and political commitment of our members. At the end there was a dialogue toward agreement on various aspects and then a vote was taken to approve preliminarily the content that the letter should have. At the close of the Assembly, some of the faithful stayed to celebrate the Eucharist. 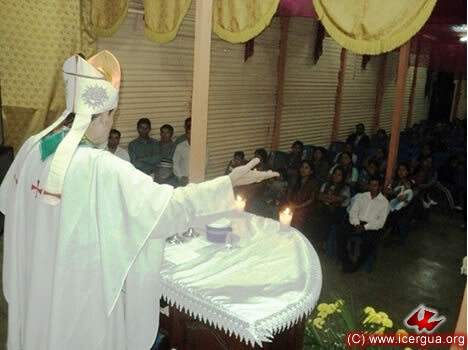 During it, a communion minister for Central Santa María Chiquimula was installed. The bishop emphasized that what is urgently necessary and indeed fundamental to guarantee the sacramental growth of the Church in the future is that the Eucharist be celebrated frequently in all the various communities. 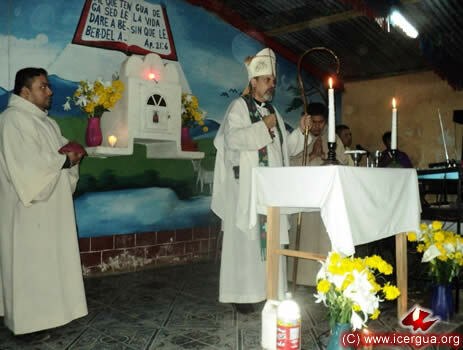 On the afternoon of May 14, our bishop was invited to preside at the Eucharist in the Buena Vista Community, San Pedro Necta, Huehuetenango. 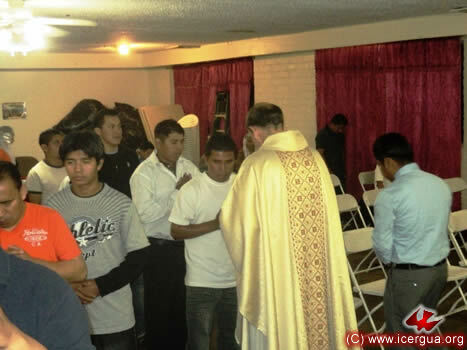 The particular reason for the invitation was to bless a phase of the construction of the pastoral house. The faithful are very enthusiastic in continuing to work unstintingly in evangelism so that the faithful who are not yet part of the community can renew their lives. During the homily the bishop remembered the importance of letting the Lord shape all our attitudes in order that we may bear abundant fruit and that it may endure. 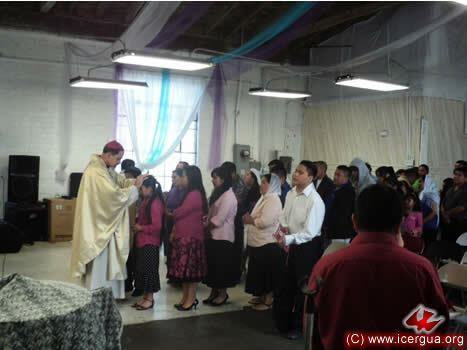 Left: At the end of the Eucharistic celebration, the blessing of the pastoral house took place. 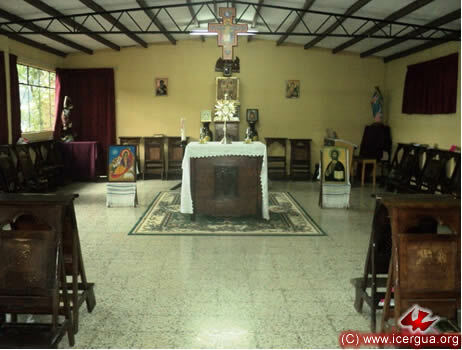 Consisting of four sleeping rooms on two floors, not all of which are completely finished, it is part of the effort that the faithful are making to build the physical structures needed to carry out their mission in the best possible way. 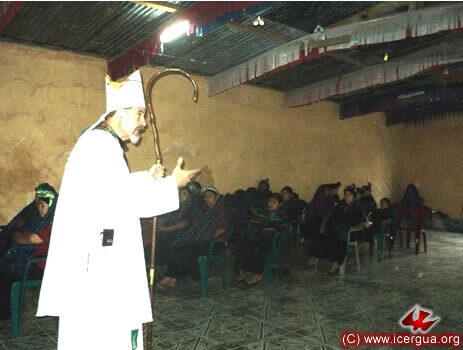 On Sunday morning, May 15, Monsignor Eduardo made his first visit to the Senegal Community, which is located in the chilly part of the municipality of La Libertad, Huehuetenango. 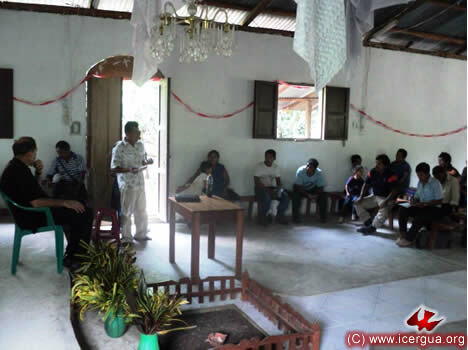 This community got its start only recently, and does not yet have a house of prayer, but its members are determined to improve their organization in order to witness effectively to the Gospel. During the bishop’s visit, a little girl was initiated into Christian Life, receiving the sacraments of Baptism, Chrismation and Communion. 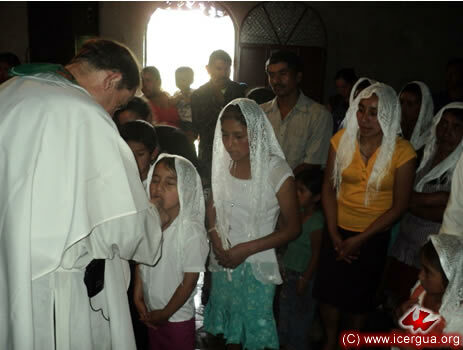 At midday, the bishop celebrated Eucharist with the faithful in the Huicá Community, La Libertad, Huehuetenango. 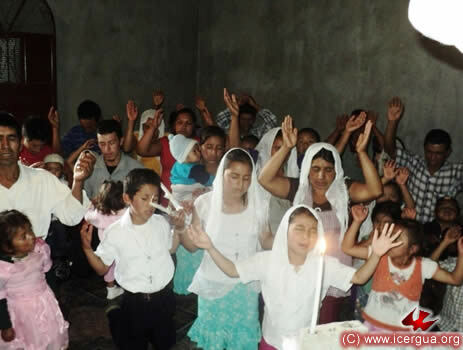 Several children was initiated into Christian Life, shown in the photograph at left. 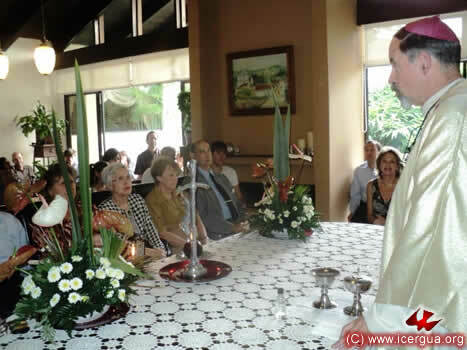 During the celebration a marriage also took place. Right: At the end of the liturgical ceremony, the parents and sponsors pray for and bless them. The community has acquired a lot on which to construct its house of prayer, and has planned where to locate the church building. The faithful hope that the work will be finished soon. 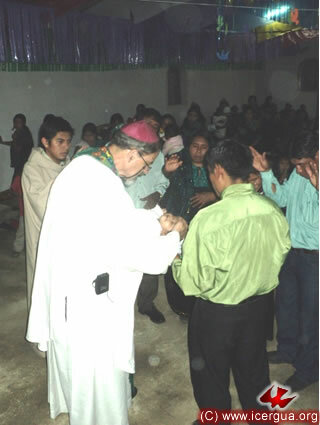 At dusk, the bishop celebrated Eucharist with the faithful of the Chinacá Community, Huehuetenango. They were celebrating Mothers Day. Two young people made their first communion. 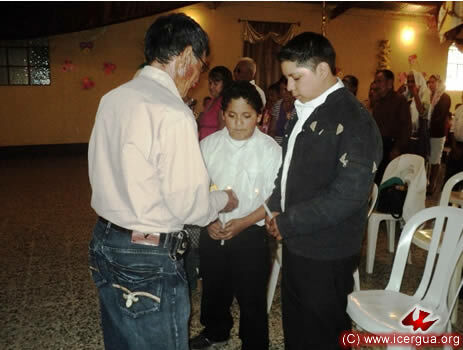 Brother Valentín, the community leader and communion minister, lighting the candles after the two young people received communion. The lighting is a symbol of the light of the Holy Spirit that, through the sacrament, illumines the hearts of believers. On Monday, May 16, the bishop traveled to New York, USA, to have a series of ecumenical dialogues. The bishops of the Russian Orthodox Church outside Russia (ROCOR) held their tri-annual synod ending Tuesday, May 17, with the Divine Liturgy concelebrated by all the bishops present, as well as by the Moscow Patriarchy’s delegate. After the Eucharist, there was a love feast and then a meeting of more than two hours with Monsignor Eduardo. The purpose of the meeting was to get to know each other better and to talk about the paths that we can follow in order to arrive at a deeper communion. The meetings took place in the central seat of the Holy Synod of ROCOR, located on 93rd Street in Manhattan, New York. Above: The presbytery of the chapel. Right: The icon of our Lord that is a reference point of great importance for ROCOR. 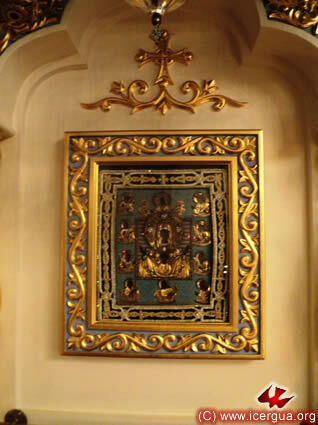 Brought from Russia during the persecutions at the beginning of the last century, it has become one of the emblems by which the Holy Mother of the Lord has manifested her presence to her persecuted children. In our chapel at the Seminary, there is a replica of this icon, which was given by Father Iván as a remembrance during his February visit. 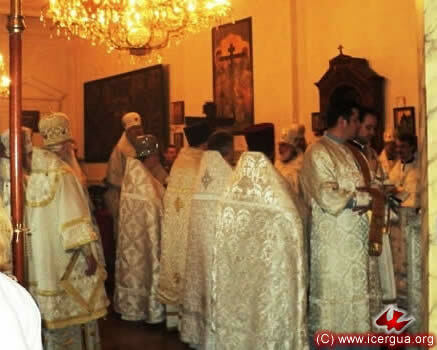 Left: The celebrants at the end of the Divine Liturgy, preparing to do the closing prayers before pronouncing the benediction. Right: Hilarion, Metropolitan of New York, Primate Bishop of ROCOR and President of the Holy Synod, addressing those in attendance. At his side is Archbishop Marcos of Germany, Dean of the Bishops. His Eminence, the Archbishop Justiniano, representative of the Patriarchy of Moscow in the United States, was also present at the meeting with the ROCOR bishops. 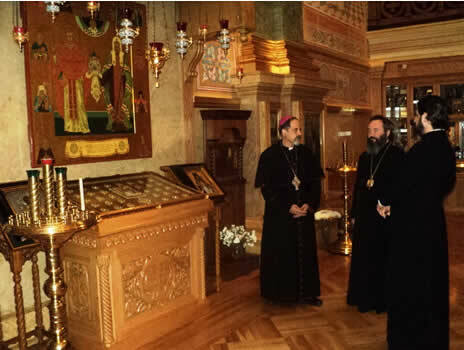 During the meeting, he brought the Patriarchy’s greetings to our Church and also invited our bishop to visit his residence in the St. Nicolas Cathedral, located a few blocks from the seat of the ROCOR Synod. The visit began with a long conversation touching on various questions whose discussion can help make progress in deepening communion. Then our bishop was invited to visit the Cathedral. 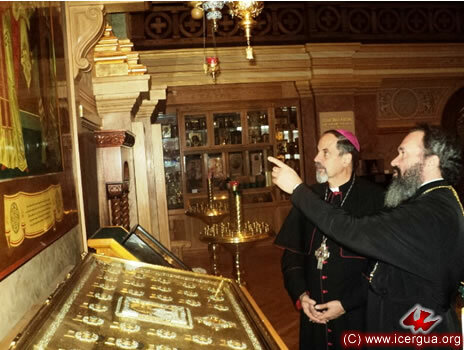 Above: His Eminence Justiniano telling our bishop the history of the cathedral’s founding at the beginning of the last century and the restorations that were done a few years ago. 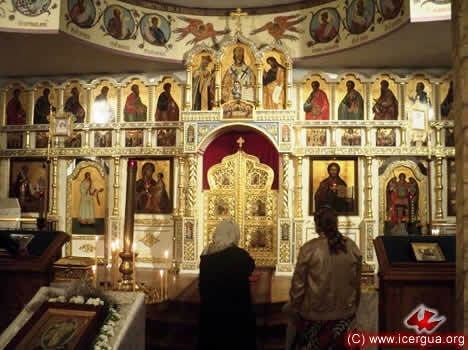 A special feature of the Cathedral is its three altars: a central one in which the Divine Byzantine Liturgy is done in Russian; the one at its left in which the liturgy of the Latin Orthodox Rite is done in English, and the one at the right in which the Byzantine liturgy is celebrated in English. Above and left: The icon in front portrays St. Patriarch Thikon. He along with the presbyter at his side, who was martyred in Russia, founded the cathedral. Father Iván served as the translator. He can be seen in the photograph at left with our bishop and His Eminence Justiniano, who does not speak English or Spanish. In the evening our bishop was invited to meet with representatives of the Orthodox Church of America. The meeting was organized under the auspices of Metropolitan Jonas, Primate of the OCA. Bishop Melchizedek of Pittsburg, Pennsylvania, Chancellor of the OCA, and a presbyter who works in the Chancellery also attended. The meeting provided the opportunity for us to get to know each other. At the end, those gathered decided that they would try to have subsequent meetings in order to deepen their friendship and communion. 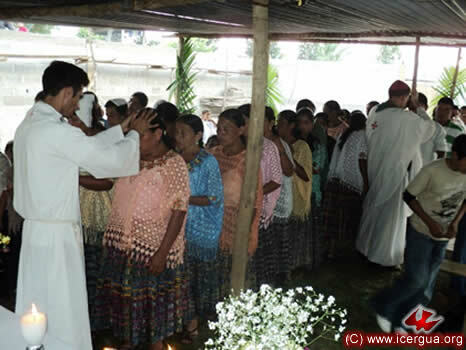 On Thursday, May 19, the Deanery of Southern Alta Verapaz took place. Representatives from all the parishes and centers in this area attended. The parishes are those of Balbatzul, Cobán; Cojaj, San Pedro Carchá; Yaxacté, Lanquin; and the centers are those of Cobán, San Juan Chamelco, Chitania and Cruce de Yaxcacán. 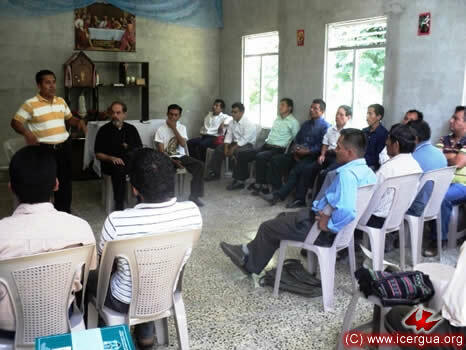 After informing one another about what is going on in the communities and hearing the reflections of the presbyters who working in this area (Fathers José Ángel Núñez and Fredy González), the bishop offered instruction. 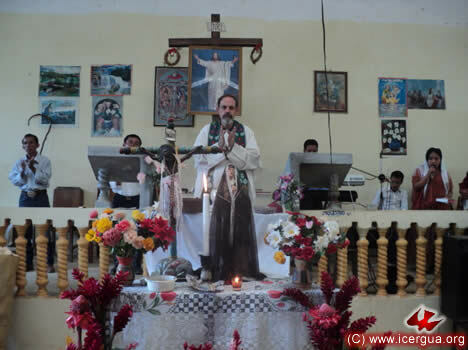 Above: Father José Ángel during his presentation. Right: Father Fredy making his report. All the participants are listening carefully to his analysis. 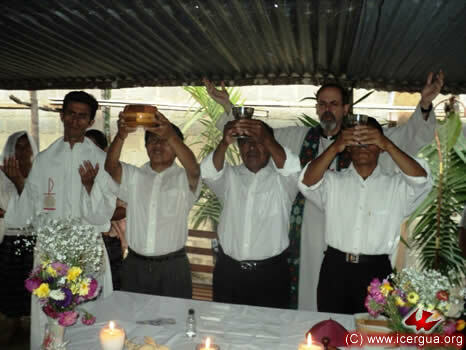 On the afternoon of May 19, the bishop, accompanied by Father José Ángel, celebrated the Eucharist of blessing the lot belonging to the Central Cobán Community. 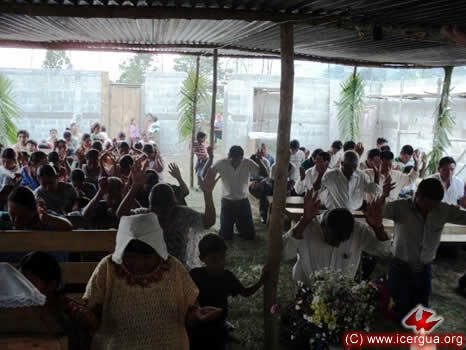 The faithful bought a large plot located in the San José neighborhood, toward San Pedro Carchá. 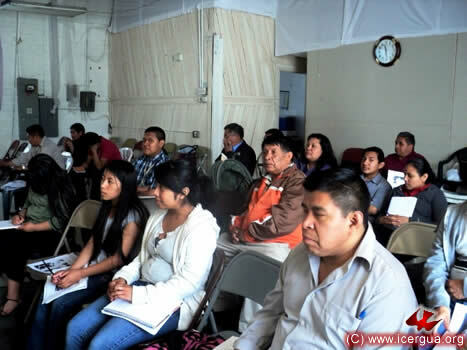 The community has maintained steady growth, and now is hoping to build a formal church. The celebration began with the Sacrament of Reconciliation. 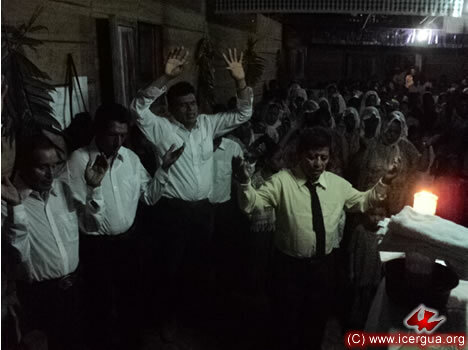 Right: The People of God invoking the outpouring of the Holy Spirit for the pardon of their sins. After the homily the blessing of the lot on which the church will be built was carried out. 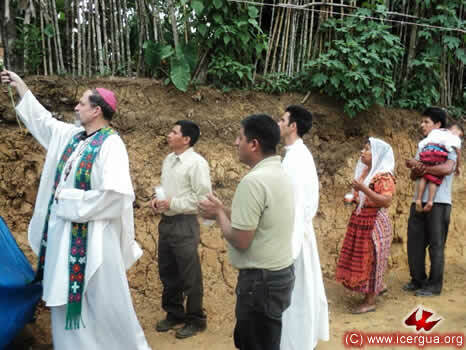 Left: the bishop walking around the plot, sprinkling the area with Holy water. 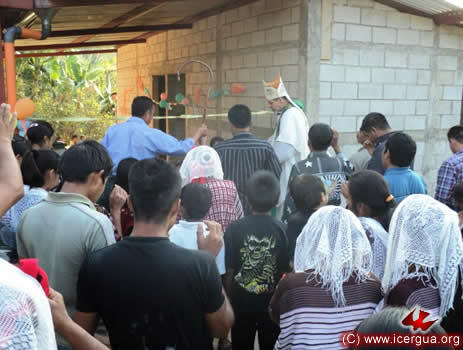 In the late afternoon, the bishop celebrated Eucharist in the Chitania Community. This is the pastoral center for seven communities. With a great effort the faithful are constructing a beautiful church, as can be seen in the photograph at left. They hope that when the construction is basically complete a new Renewed Catholic Parish can be established in this center. 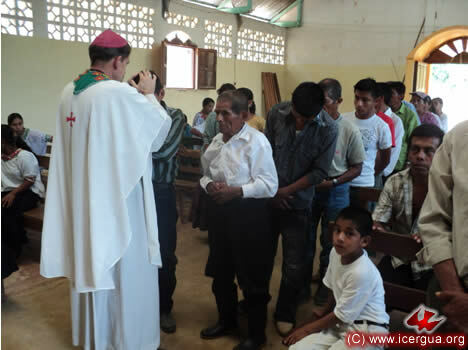 As is the custom when the bishop comes to the communities of ICERGUA, the visit began with the administration of the Sacrament of Reconciliation. Right: Father José Ángel and the bishop administering the Absolution for those who had confessed their sins. During the celebration communion ministers from various communities were installed. Left: The new ministers presenting the offering for the Eucharistic celebration. 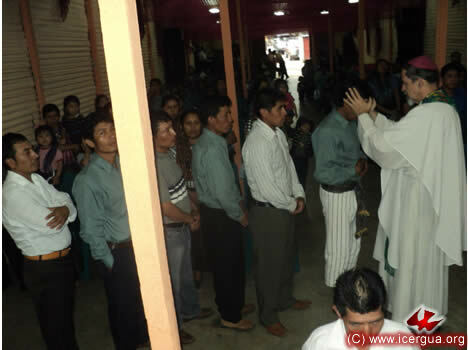 On Friday morning, May 20, the Deanery of Petén and North Alta Verapaz took place. 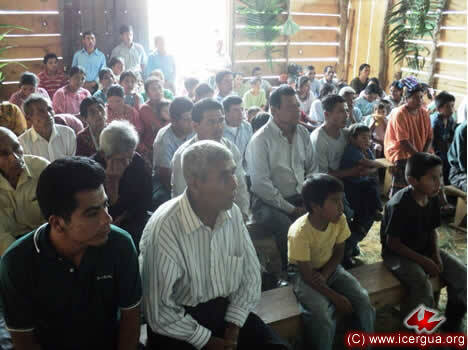 Representatives from the parishes of San Fernando, Sayajché, Petén, and Chisec, Alta Verapaz, as well as representatives form the centers in La Libertad, Petén, San Benito, Petén, and Yalicoc, Raxruha, Alta Verapaz. The faithful reported on the growth that they have had recently, as well as the various mission projects that they are carrying out. Above: Brother Vicente, president of the Pastoral Council of San Fernando, making the report on the activities that they have carried out. Right: The bishop during the instruction period. 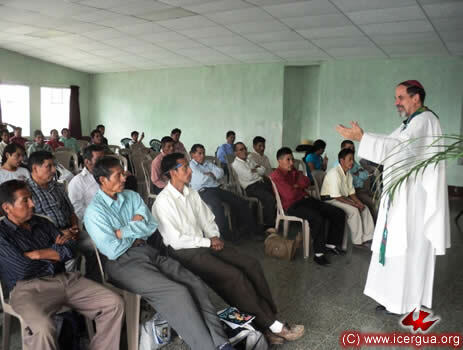 He talked about the possible content for the next pastoral letter concerning social commitment, which was submitted for the approval of the delegates. 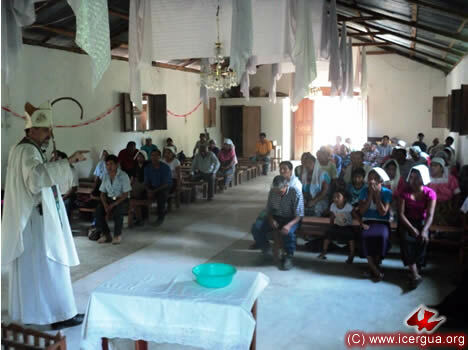 In the afternoon, the bishop made his first visit to the Seposil Community, which, although it is part of the Chisec Parish of ICERGUA, is under the civil administration of the municipality of San Pedro Carchá, Alta Verapaz. 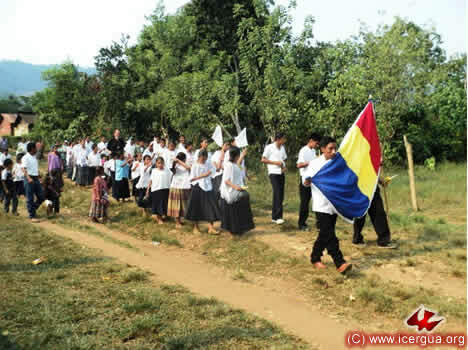 The young people who were to receive confirmation came out to greet the bishop, carrying a version of the ICERGUA flag. Inside the house of prayer there was hardly room for the confirmands and their sponsors. Outside many faithful were also participating in the celebration. In the evening, the bishop visited the Yalicoc Community. 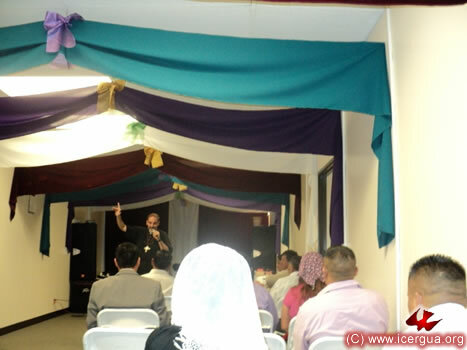 During the celebration, in addition to baptisms, several ministers were installed to serve in various communities that are part of this center. It includes the municipalities of Raxruha, of Fray Bartolomé de las Casas and of San Luís Petén. Above: Those were about to be installed as communion ministers are at prayer. Right: The bishop baptizing one of the children who were being initiated into Christian life. 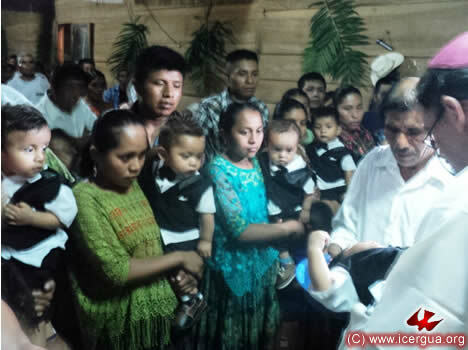 In the photograph are four other children who were baptized. 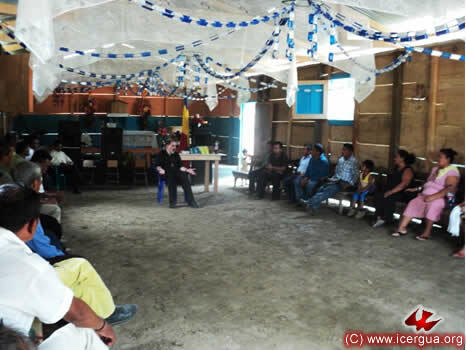 On Saturday morning, May 21, the bishop visited the different parts of Ixcán, in the extreme north of the Departament of El Quiché. 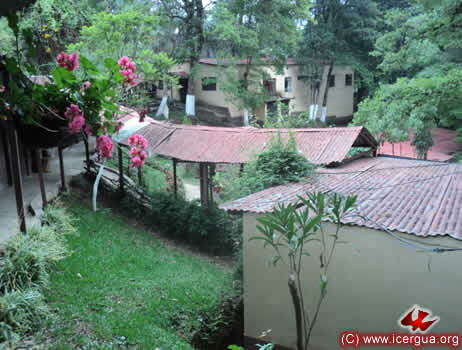 The circuit began with the Verapaz Community, where we have bought a 5000-meter lot, on which the mission center is to be built for the Ixcán communities. On the south, the beautiful property fronts onto the Cross Northern highway, making it accessible for all the communities. 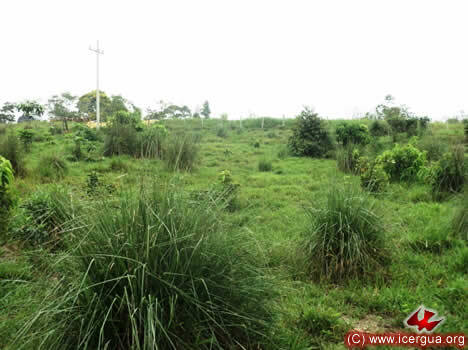 The boundary on the north its is a river, which guarantees a water supply for the center. Above: View of the northern part of the property. 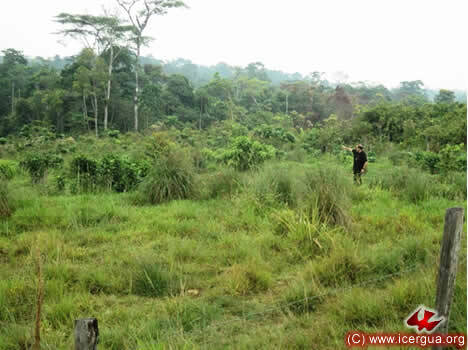 Right: View of the southern part of the lot, bounded by the Cross Northern Highway. 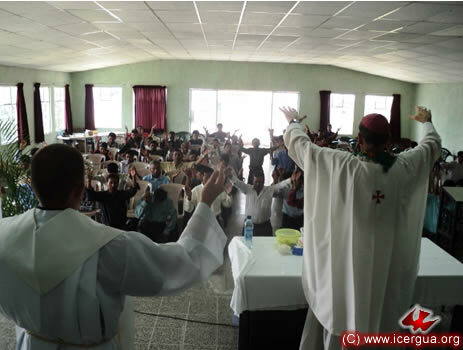 On the morning of May 21, the Deanery of Ixcán was celebrated. 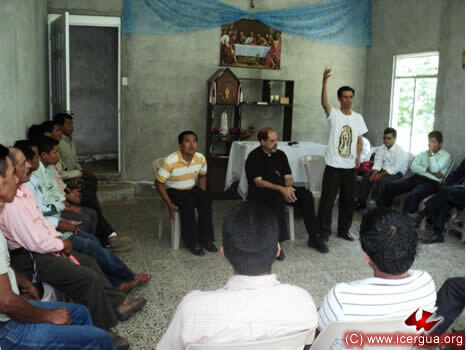 The members of the “Efusión del Espíritu Santo” Parish were introduced to the new Pastoral Council that had been elected a few days before. Brother Macario was elected President of the Council. He is a young man and while he may be lacking in experience he is eager and energetic to serve the Lord unstintingly. Left: Brother Macario addressing the Assembly and giving his ideas on what he hopes will happen during his presidency. 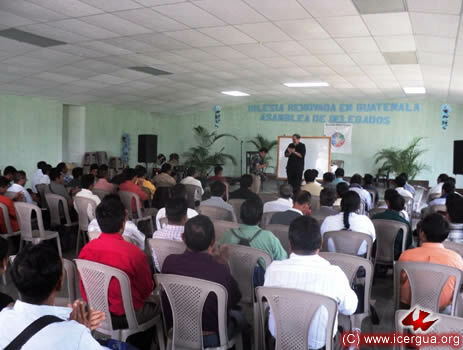 The faithful of the “Santiago Ixcán” Center reported on the area where they work. They announced that they had begun the process of forming four new communities. During the instruction period, the bishop focused on the theme of the next pastoral letter. The faithful approved the various proposals for its content. They see it as the basis for developing our church’s Social Teaching. In the afternoon Eucharist was celebrated with the Deanery participants. 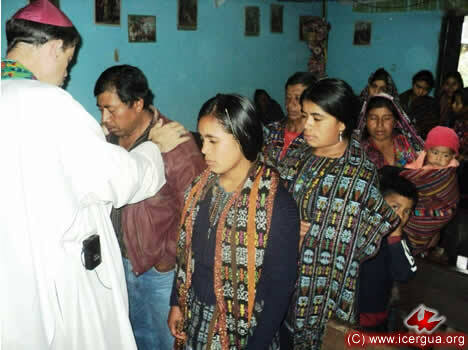 An underlying objective was to install a communion minister for one of the communities so that communion could be taken to communities where it is not possible the celebrate the Eucharist. During the homily the bishop emphasized that the Renewed Catholic Easter experience involves accepting a missionary commitment like that of the apostles, for the mission entrusted to us parallels the one they received. 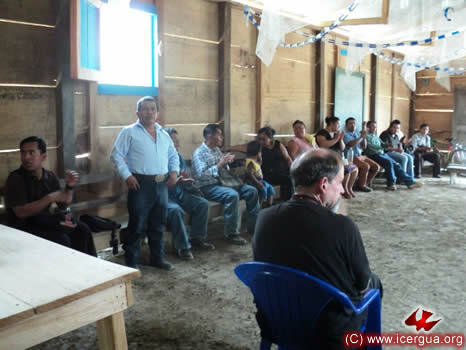 In the evening of May 21 our bishop made his first visit to the El Edén Community in El Ixcán. This community covenanted with us only three months ago and since then has become consolidated. About three hundred faithful participated in the Eucharist. 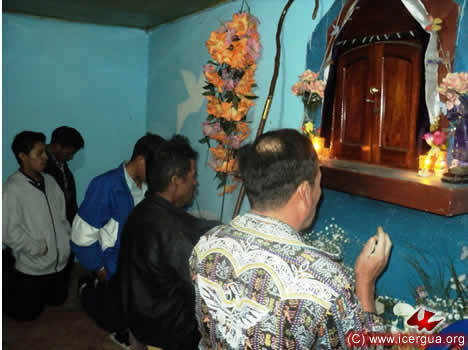 Also Christian Initiation was celebrated for the children of some of the faithful. Right: In the foreground are the parents and sponsors of the children that were about to be initiated into Christian Life. Left: The celebration began with the administration of the sacrament of Reconciliation. After the faithful had made their repentance and confessed their sins, the bishop imparted absolution. 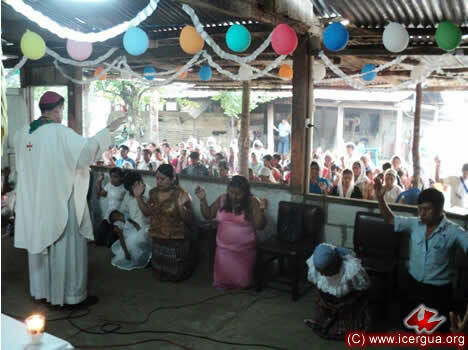 On Sunday morning, May 22, Monsignor Eduardo visited the Parish Center of Cristo Resucitado de Balbatzul. 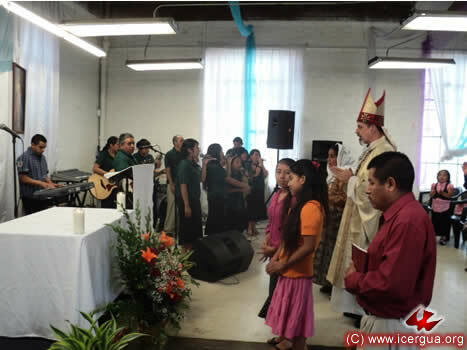 The faithful of a small community that has begun to take shape near the parish center were introduced. They plan to join our Church. 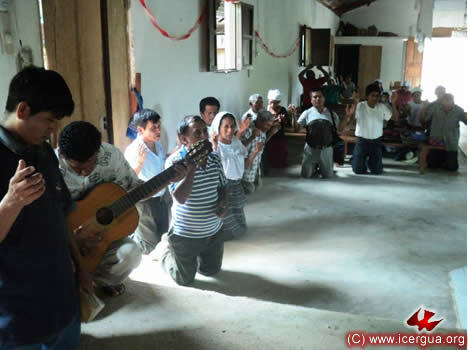 To accompany the singing during the liturgy, the faithful had invited the Music Ministry of the Santo Tomás Purahú Community to participate in the Eucharist. 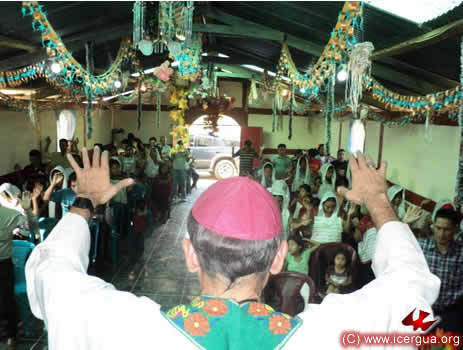 Santo Tomás is the largest community in the parish and at present is constructing a beautiful church on a hilltop that dominates the area where the community is located. 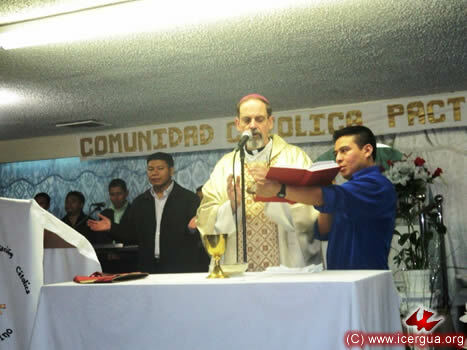 On the afternoon of May 22, Monsignor Eduardo presided at the celebration of the Eucharist with the Central San Juan Chamelco Community. The community was celebrating its anniversary and renewing its commitment to organize to carry out an effective mission. During the homily the bishop emphasized that the celebration of an anniversary has to be a moment for giving thanks to God for all the blessings received but, above all, it has to be an opportunity to renew an awareness of the Lord’s call and the mission He has given us and to renew enthusiastically the mission commitment entrusted to us. 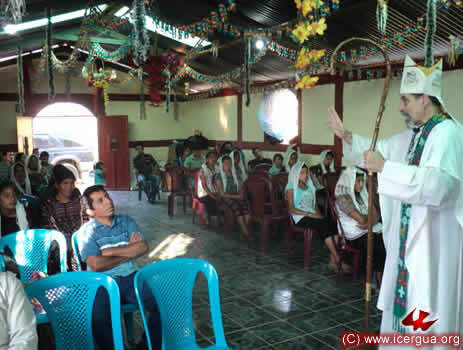 On Friday, May 27, the bishop began his missionary circuit with the “Efusión del Espíritu Santo” Community in Santiago Atitlán, Sololá. The faithful had gathered for the Eucharist, which began with the administration of the sacrament of Reconciliation. During the homily the bishop emphasized the urgency of reviving the missionary commitment. Like the Apostles in the first years of the church, we have a mission to announce the Good News that leads to conversion and communion with other faithful within the Church. 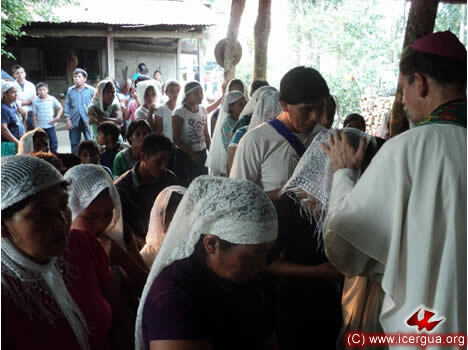 In the late afternoon, the bishop celebrated the Eucharist and the Christian Initiation of three children in the Pentecostés Community of Santiago Atitlán, Sololá. 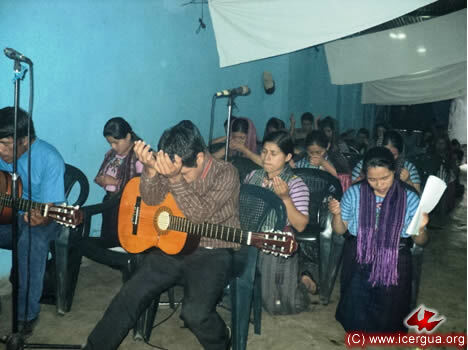 Left: The members of the Music Ministry and Chorus while they are praying their repentance, confessing their sins and asking the Lord’s pardon. The three children who were baptized are part of a family that has recently joined the church. Above all the parents expressed their commitment to persevere in the life of faith within the Church. Right: The children participated in the celebration to the extent that their young age allowed. 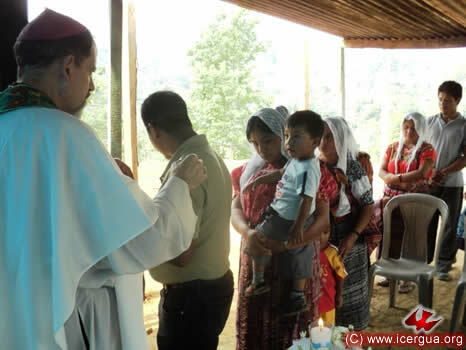 On Saturday, May 28, the bishop celebrated the Christian Initiation of a child and the Eucharist with the Jaibalito Community, Santa Cruz La Laguna, Sololá. The child who was baptized is the son of one of the community directors. 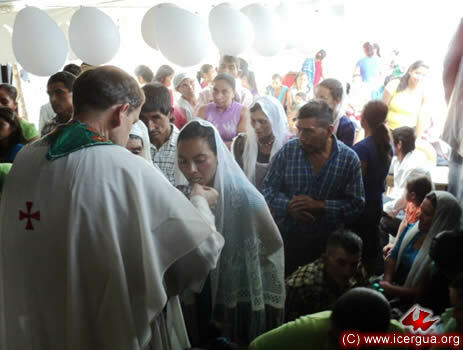 The bishop in his homily emphasized that the celebration of Christian Initiation for a child unavoidably involves the renewal of the whole family and the community in the life of faith and the commitment to evangelize. 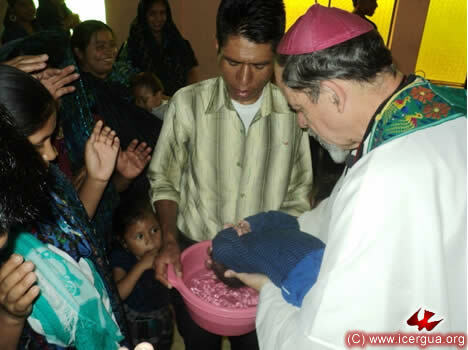 Above: The bishop pronouncing the words, “Juan, be baptized in the name of the Father and of the Son and of the Holy Spirit” and pouring the water over the child who was being initiated into Christian Life. Right: Some of the faithful who were participating in the Eucharist coming forward to receive communion. 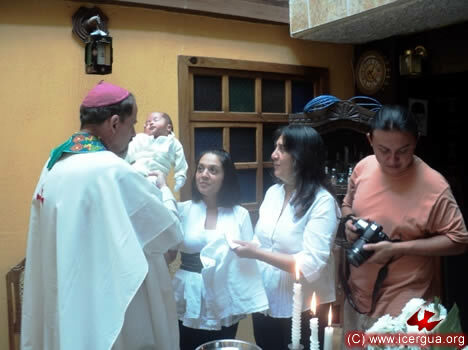 On the morning of May 28, the bishop celebrated the complete Christian Initiation of Santiago David in Panajachel. After the explanation of what this initiation meant at the beginning of the Christian Church and what it requires of those to whom the sacraments of Baptism, Chrismation and Communion are administered, the child’s parents and sponsors asked that he be initiated wholly, that is in addition to Baptism and Chrismation he also participate in the communion with the Eucharist. It was a beautiful spiritual experience and a foreshadowing sign on the road along which we feel that Lord is leading us. 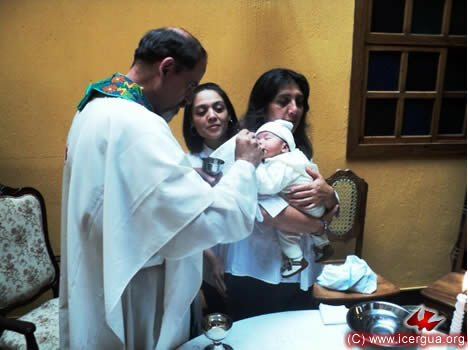 Above: After being baptized, the child is presented by Monsignor Eduardo to its parents and sponsors, emphasizing that from then onwards, the child is to be recognized as a child of God and an heir of His kingdom. Right: The bishop giving communion in both species to the child who had just received Baptism and Chrismation. 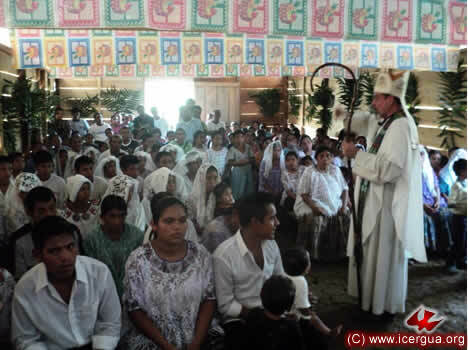 On the afternoon of May 28, the bishop celebrated a Mass of Thanksgiving with the Xolbé Community. The faithful participated with much joy and committed themselves to continue the mission work with dedication and devotion. After taking communion, the faithful are on their knees praying and giving thanks to God for the inestimable gift of the Eucharist.